It’s autumn in the northern hemisphere and the time of year when students are going to colleges and universities for the first time. If they are enrolled at Stephens College in Columbia, Missouri – there’s a high chance that their dog can come too! 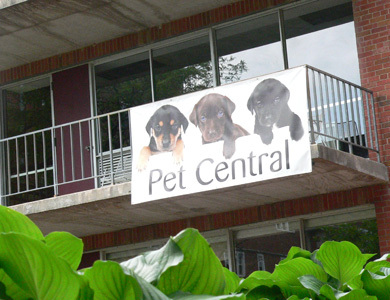 Searcy Hall at the college is better known as Pet Central and houses 40 students and their pets. Pets have been accepted at the college since 2004. The college also has a pet fostering program. They’ve partnered with a local no-kill shelter and students can foster a dog during their time at college and train and socialise them in preparation for adoption. A scholarship, room discount, paid food and medications, and pet deposit waiver are just a few of the benefits available to freshmen and transfer students who apply to participate in the pet fostering program. Sadly, the college’s insurance policy excludes these breeds from staying at Pet Central: Pit Bull, Rottweiler, Chow, Akita and German Shepherd. I’m not a supporter of breed-specific legislation and so it’s hard to accept these types of restrictions but that’s the influence of the underwriters, unfortunately. Daniel looks like an ordinary beagle. But he isn’t. He’s a survivor – quite literally. In October 2011, Daniel was placed in a gas chamber in Alabama to die with three other unwanted/unclaimed dogs. The miracle is that Daniel survived the gassing (by carbon monoxide). The folks at Eleventh Hour Rescue, a rescue organisation that aims to save dogs from high-kill shelters, heard about Daniel and took him to New Jersey to find a forever home. After fostering, Daniel was re-homed with Joe and Geralynn Dwyer. Mr Dwyer now is a guest speaker around the country to encourage the banning of gas chambers in the United States and Mr Dwyer is happy to promote Daniel as the face of the anti-gassing law. The law has been called “Daniel’s Law” in honor of Daniel. Pennsylvania is the most recent state to enact it. Only 19 states in the USA have banned the use of gassing as a means of euthanising unwanted dogs and over 4 million animals are euthanised each year in the country. The Royal NZ Society for the Prevention of Cruelty to Animals (RNZSPCA) has embraced the philosophy that ‘every life is precious’ and its Saving Lives campaign has a number of platforms to ensure that the lives of animals are saved and that they enjoy a quality of life. The Hokitika SPCA has made headlines for achieving a no-kill shelter status, a direction that the RNZSPCA not only endorses, but says that it wants to see replicated throughout the country . Read all about it in this article in the Greymouth Star.